(Phys.org) —Watching a tree grow might be more frustrating than waiting for a pot to boil, but luckily for biologists, there are tree rings. Beginning at a tree trunk's dense core and moving out to the soft bark, the passage of time is marked by concentric rings, revealing chapters of the tree's history. Galaxies outlive trees by billions of years, making their growth impossible to see. But like biologists, astronomers can read the rings in a galaxy's disk to unravel its past. Using data from NASA's Wide-field Infrared Survey Explorer (WISE) and Galaxy Evolution Explorer (GALEX), scientists have acquired more evidence for the "inside-out" theory of galaxy growth, showing that bursts of star formation in central regions were followed one to two billion years later by star birth in the outer fringes. "Initially, a rapid star-forming period formed the mass at the center of these galaxies, followed later by a star-forming phase in the outer regions. Eventually, the galaxies stop making stars and become quiescent," said Sara Petty of Virginia Tech, Blacksburg, Va., lead author of a paper appearing in the October 2013 issue of the Astronomical Journal. "This later star-forming phase could have been caused by minor mergers with gas-rich neighbors, which provide the fuel for new stars." 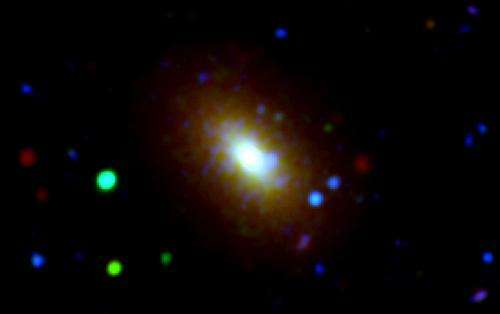 The discovery may also solve a mystery of elderly galaxies. The galaxies in the study, known as "red and dead" for their red color and lack of new star births, have a surprising amount of ultraviolet light emanating from the outer regions. Often, ultraviolet light is generated by hot, young stars, but these galaxies were considered too old to host such a young population. The solution to the puzzle is likely hot, old stars. Petty and colleagues used a new multi-wavelength approach to show that the unexplained ultraviolet light appears to be coming from a late phase in the lives of older stars, when they blow off their outer layers and heat up. GALEX and WISE turned out to be the ideal duo for the study. GALEX was sensitive to the ultraviolet light, whereas WISE sees the infrared light coming from older stars. GALEX is no longer operating, but WISE was recently reactivated to hunt asteroids, a project called NEOWISE (see http://www.jpl.nasa.gov/news/news.php?release=2013-257 ). Both telescopes have large fields of view, allowing them to easily capture images of entire galaxies. "The synergy between GALEX and WISE produces a very sensitive measurement of where the hot, older stars reside in these red-and-dead galaxies," said Don Neill, co-author of the paper from the California Institute of Technology, Pasadena. "This allows us to map the progress of star formation within each galaxy." Ned Wright of UCLA, a co-author of the study and the principal investigator of WISE before it was reactivated, compares the multi-wavelength range of the two telescopes to musical notes, "WISE itself covers the equivalent of a three-octave range, while WISE and GALEX together cover a seven-octave range." Inside-out growth? Say it ain't so! I'd assumed it is the opposite. Gravity pulls mass inward. Those are first generation stars on the fringes of galaxies, second generation stars further in, then the core. It would seem intergalactic gases are being pulled in, form the outer stars, which then burn out and their metals and other heavy elements fall further into the galaxy, for the next generation and so on. The Big Bang model seems to be having serious age issues that are not being acknowledged, given those very distant galaxies had to form in the galactic equivalent of overnight. How long will everything be shoehorned to fit in this model, before questions are raised? Brodix, I read it the same way you did. I also agree that this would create a serious age problem for the BB theory.